This most interesting and unusual surname is of Anglo-Saxon origin, a derivative of the Olde English pre 7th Century term "helian", meaning to cover, roof, and was an occupational name for a slater or tiler, or even a thatcher. Job descriptive surnames originally denoted the actual occupation of the namebearer, and later became hereditary. 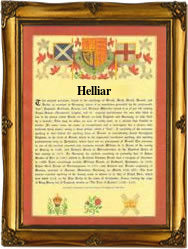 ariants of the surname in the modern idiom are Helliar, Hellyer, Helyer, Hilliar, Hillier, Hillyar, Hillyer and Hilyer. The surname first appears in records in the late 13th Century (see below), while other early examples of the name include: Gilbert le Helyere, who is recorded in Hampshire in 1280, in the "Middle English Surnames of Occupation, 1100 - 1350"; and Robert le Hillier, mentioned in 1347, in the Calendar of the Close Rolls of Bedfordshire. Henry Hellier (1662 - 1697), studied at Corpus Christi College, Oxford and became vice-president in 1697. Sir James Hillyar (1769 - 1843) was appointed rear-admiral in 1837, having distinguished himself in the Mediterranean. A Coat of Arms, depicting a silver chevron guttee de sang between three gold mullets, with the Motto "Pro Republica Semper" (For the State always), was granted to Sir Samuel Hellier, High Sheriff of Staffordshire in 1763, who bequeathed his estates and his Coat of Arms, by royal licence, to Rev. Thomas Shaw of Woodhouse in Staffordshire. The first recorded spelling of the family name is shown to be that of Robert le Heliere, which was dated 1275, in the "Hundred Rolls of Kent", during the reign of King Edward 1, known as "The Hammer of the Scots", 1272 - 1307. Surnames became necessary when governments introduced personal taxation. In England this was known as Poll Tax. Throughout the centuries, surnames in every country have continued to "develop" often leading to astonishing variants of the original spelling.